Tia Pham | How Much Does It Cost To Renovate A Home? How Much Does It Cost To Renovate A Home? The exact cost of updating your home will depend on its size, what kind of work needs to be done and the types of finishes you choose. Knowing your numbers ahead of time is crucial. After this article, you should be able to set a budget for your project(s) and conclude on needs vs. wants. Paint plays a major role in renovating but the big ticket items are appliances and cabinets - kitchens and bathrooms. Good news is, these two rooms also provide the most return on investment. 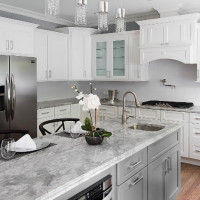 Kitchen: If only minor upgrades are needed, renovations should start around $10,000. The average cost of a remodel is approximately $25,000. A full gut can reach up to $50,000 depending on the quality of materials and appliances chosen. Bathroom: A bathroom upgrade typically costs about $8,000 and tops out at $20,000. New Roof: The cost of protecting all your upgrades from the elements will run around $20,000. New Floors: Installing hardwood floors will cost between $15,000-$20,000 (approximately $6 to $8 per square foot). Laminate is the cheaper alternative, costing between $7,500-$12,500 (approximately $3 to $5 per square foot). If your current floors need to be removed, it is about $1 per square foot. Labour is extra and depends on the contractor. Electrical Updates: If you're replacing an old panel, expect to spend $3,000-$5,000. Windows: The cost ranges between $8,500-$20,000 depending on quality and material. Basement: Finishing a basement will cost approximately $30,000. Retrofitting for a basement apartment can add another $25,000. Get price quotes from at least 3 qualified contractors and ask to see photos of their previous work and references.